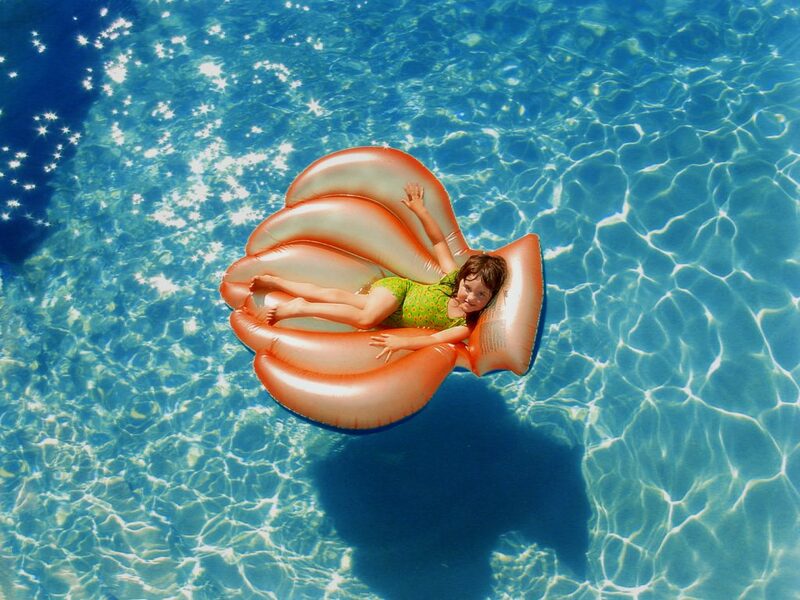 Make This The Best Summer In The Pool Ever! A swimming pool makes its own fun. It doesn’t require input to make it better. It just is. Of course, you could plan a party. You could invite friends and family over. You could turn the backyard into even more of a staycation spot thatn it is already is. You could also kick back, adult beverage in hand and relax poolside. Truly, there is nothing you cannot do to enjoy yourself in the family pool. With a swimming pool you probably won’t even hear “we’re bored!” the first day that school is out of session for the summer. 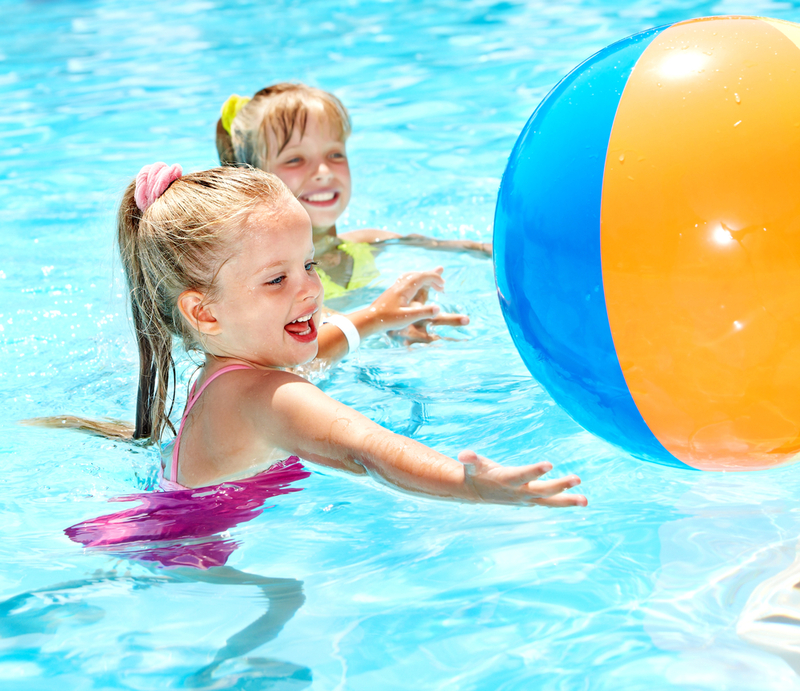 Kids know when there is a pool in the proximity and an adult in attendance, they can make their own fun in the pool. Pool parties are fun, too. When you plan a pool party you’re inviting friends and family to come and enjoy you in the pool that you love so much. When you have a swimming pool, we’ll bet your home is party central because wouldn’t you rather attend a party where there is a pool than a party where there isn’t one? We know we’d rather pack our bathing suits! If you’re having a pool party, you may want to amp up the fun with some pool games or with a few pool noodles and inflatable toys. Let’s just say you’re looking to make your home and your pool be the talk of the neighborhood. Why not try these games and wow friends and family. They may already know them and they may already have played them, but if they’re used to coming to your home for a party and just swimming laps, they will LOVE that you’re planning games! Beach ball races. Grab small beach balls, divide up into teams and give each team a beach ball. Someone poolside shouts “go” signal and the swimmers will grab the beach ball, hug it gith, then swim from one end of the pool to the other. The first team who gets all of its swimmers back and forth is the winner. Hungry Shark — kind of like Marco Polo, just with “sharks!” Choose someone to be the shark. The shark will float in the pool waiting for other swimmers to float close by and taunt the shark with “hey, shark aren’t you hungry? Bet you can’t catch me!” To which, you, the shark jumps toward the swimmers and tries to catch them for lunch! Rubber duck race. Drop some cute colorful rubber duckies into the pool. Divide up the swimmers and have each swimmer race to move one duck from one end of the pool to the other. 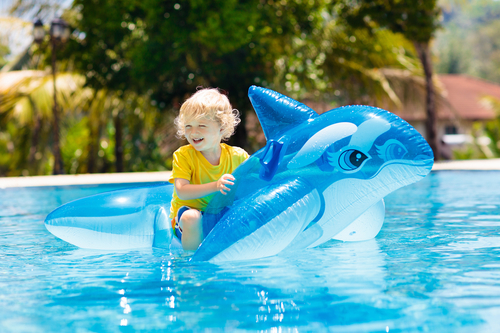 If you have young children in the pool who aren’t strong swimmers, have them chase the duck from side to side rather than lengthwise in the pool. Want to make it even harder aka more fun? Use colored ping pong balls! Prevent sunburn. If you get a sunburn, you will lose precious time in the swimming pool. Liberally apply sunscreen to prevent burns. Look for waterproof sunscreen. Reapply often. Get out of the sun if you’re not swimming. Set up pool deck chairs in shaded places. Wear a hat. Don’t forget to put sunscreen on your face and on your ears! Water reflects the sun’s rays, increasing harmful UV ray exposure. Know how many people are in the pool and designate one or more people to keep track of them. When everyone is having fun in the pool it’s easy to loose track of swimmers. Make certain you know who’s in the pool at all times and keep track of them. Children should wear life vests — even if they know how to swim, when there are a lot of people in the pool at the same time and when it’s not easy to keep track of everyone. Properly mark the pool. If the pool has a shallow and a deep end, clearly mark the shallow end. Light it up. If your pool party goes into the night, make sure you have in pool lighting — especially if you have a deep end — to keep it lit up enough that you can keep track of everyone who is swimming. Have a first aid kit, life vests and a retrieval pole handy. Ppssst! Guess What? You’re The Reason The Pool Water’s Dirty!